I am in love with Kyinka! It is the perfect mixture of nothing to do and everybody to meet. Almost everyday, my cluster and I take a walk around the village and explore its endless maze of streets. Last week, we met a Babushka named Pasha who wanted to know everything about our lives but couldn’t understand that we didn’t speak more than five words in Russian. Today, another Babushka flagged us down. We thought she was upset because we were talking too loud, but she really just wanted to show us her pet hedgehog! Last Friday marked the successful completion of my first full week of language and technical training! Now, I can actually speak in complete Russian sentences and have a vocabulary of about 100 words. 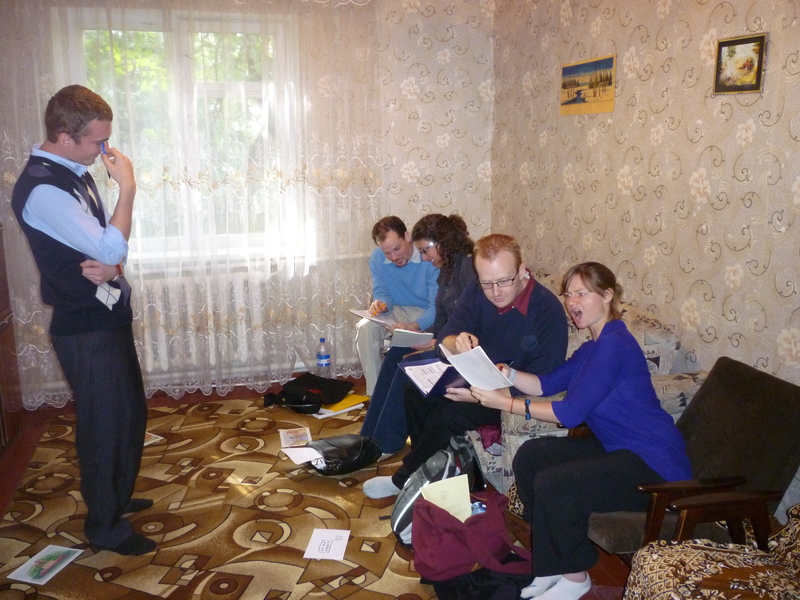 Russian class is held for four hours everyday in the living room of our language teacher, Dennis. Since there are only five people in my cluster, we get a lot of personal attention and are therefore able to progress much faster than any language class I have experienced in school. It is great! But the best part is…we don’t get graded! Whoohoo! This doesn’t mean class is entirely stress free, but it makes learning much more pleasant. Our goal is to be intermediate-mid level speakers by the end of three months. If our progress goes as well as the first week, that will be no problem. 🙂 However, once service starts in December, it becomes the volunteers’ responsibility to make further progress. My host sister Natasha (red skirt) dancing at her school's teacher appreciation day. She also sang a solo! Our cross-cultural & technical training is held for three hours everyday – usually after our lunch at the village school. In these sessions we learn about the Ukrainian grading system, taught how to plan lessons and discuss some of the more drastic cultural differences and similarities between Ukrainians and Americans. 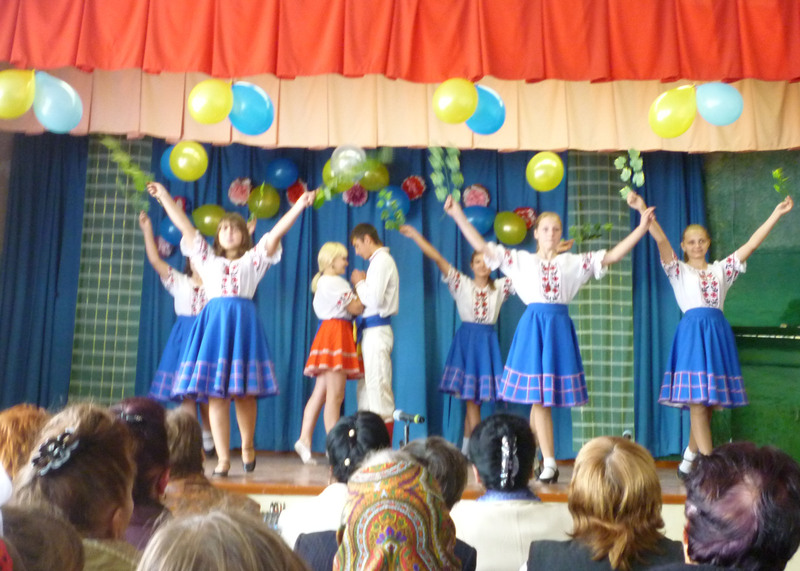 The Ukrainian school school system is the hardest concept for our cluster to understand. It differs from the US school system in four main ways (1) Students CANNOT fail a class or grade (2) Every grade is based on a 12 point system, 12 only achieved by creative application and 1 only achieved by those who don’t attend school at all (3) Grades are given aloud in class to students at the end of each class and (4) Students only attend grades 10 & 11 if they plan on attending University. If you get good grades in school you can attend University for free, if not, you must pay to attend. As for teaching, I am required by law to have a written, detailed lesson plan with me during every lesson. When not in training, I spend most of my time walking/running with my cluster, memorizing vocabulary words, or hanging out with my host family. My host sister Natasha, always has something for me to do with her and my host mother loves to simply sit at the kitchen table and make me repeat vocabulary words to her over and over again. Papa Yuri is often away on business, so I don’t see him very often. Igor is a typical brother – always trying to scare me or make fun of my funny accent. I washed my clothes for the first time tonight and ended up with blisters on my knuckles. I guess I’m either washing them too rough or doing it wrong… Now all my clothes and underwear are hanging outside next to the dog pen for the world to see. We’re super excited for you! The pictures look awesome and it seems like you have a great host community! Hope you enjoy every day and we miss you! It sounds like you are having a good time. How has the weather been? Have you had any unusual foods? It was a little disturbing seeing the picture of your host mom with the bloody knife and I would assume the pig heart.